The ovenbird is a warbler that looks like a small speckled thrush. Thus deep forest bird only thrives where forest remain in large blocks, probably because if clearings are nearby, there are more nest predators and parasitic brown-headed cowbirds. Although spotting the forest dwelling ovenbird takes patience, the bird’s TEAcher-TEAcher-TEAcher-TEAcher song is distinctive and rings through the woods in spring and summer. A good look at the ovenbirds head will help you differentiate it from larger thrushes and same-sized water thrushes. The wide, white eye ring is the first clue. The water thrushes lack this, having instead a white stripe running from above the eye to the back of the head. Several species of brown-backed thrushes have eye rings that are not as pronounced. Thrushes hop and feed at one moment still, then dashing; the oven bird walks methodically. The ovenbird has neat “stripes” or spots running down its breast, while the thrushes are more randomly speckled underneath. While not always visible, the ovenbird’s black-bordered, orange crown patch is diagnostic field mark. 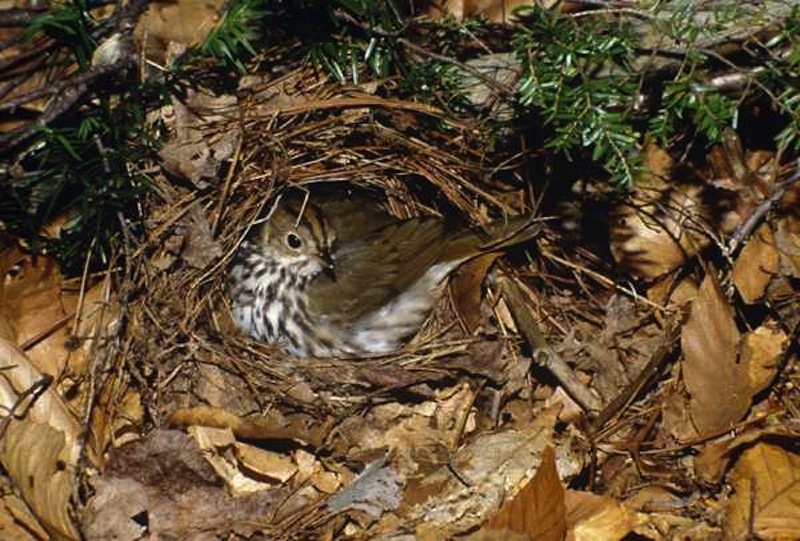 Ovenbirds nest in mature deciduous or mixed deciduous and pine forests, but they can appear in any habitat during spring and fall migration. Most winter in Mexico and Central America and on the Caribbean Islands. 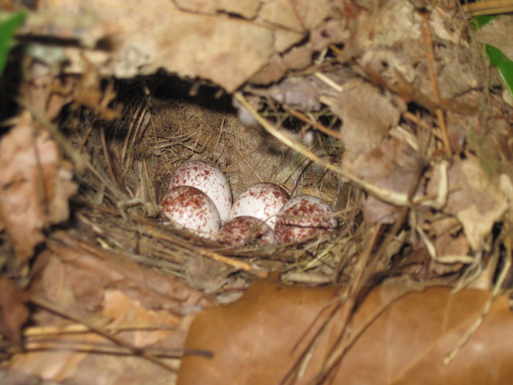 Forests that host nesting ovenbirds have a thick layer of dry leaf litter beneath them, providing the birds with feeding and nesting opportunities. The ovenbird quietly chugs along the leafy forest floor, walking and looking for insects, spiders, and other invertebrates, such as earthworms and snails, among the leaves littering the ground. This bird is named for its domed nest, which usually sits on the ground, and is so well camouflaged with dead leaves that you can easily walk past with out noticing it. 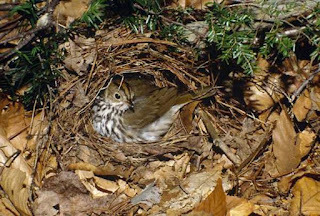 Although leaves help conceal the nest, the female ovenbird constructs the nest structure using grassed, bark and other materials. There is a side entrance for stealthy exit and entry. Inside, the female lays four or five eggs and incubates them for up to two weeks. Both parents, feed the young. They leave the nest after about a week, but they are still fed by the adults for about two weeks afterward. If you have a well-treed backyard with ample leaf litter, you may spot a foraging ovenbird walking your woods during migration. If you hear the ovenbird’s loud song, watch for it on a low to mid-height perch or foraging on the ground. You will hear the teacher teacher teacher of the oven bird resounding through the woods here at Songbird Prairie Bed and Breakfast Inn and Spa. Here at Songbird Prairie Bed and Breakfast Inn and Spa, a Valparaiso, IN B&B, you will experience the thrill of viewing baby bluebirds in their nesting boxes. The eastern bluebird is our most famous thrush, even more popular than it’s cousin the American robin. It’s beauty, it’s song and it’s willingness to live close to us has inspired many poets, songwriters, artists, and bird watchers. Bluebirds, according the Audubon Society, will be attracted to your property if you have a large open lawn, especially if you provide housing. 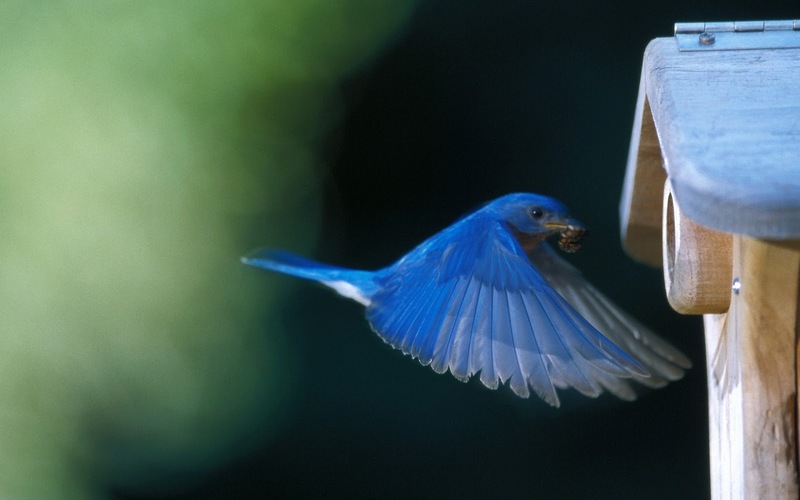 Thanks to a concerted effort by bluebird lovers, as we are, the boxes are built and posted and therefore, the eastern bluebird has rebounded from it’s low population in the 1960s. The sky-blue and rusty breast of the make bluebird are echoed in the females’ more muted tones. There are three bluebird species in North America, but only the eastern in commonly found east of the Mississippi. We see the bluebird here at our Valparaiso B&B all year long. Drink your TEA sings the towhee throughout the brushy woodlands here in Valparaiso, Indiana at Songbird Prairie Bed and Breakfast Inn and Spa. June 30 Fireworks on the Lakefront! August 12 S’mores Day Fun! At Songbird Prairie, one of our guests most favorite birds is the white-breasted nuthatch. 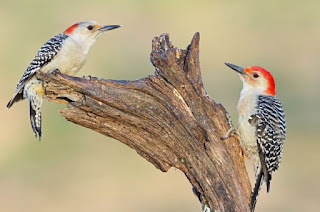 I think it is because they are universally known as the “upside down birds” because the forage by probing the bark of tree trunks with their heads downward. During their journeys down the trunk of a tree, they often stop, and then raise their head so that it is parallel to the ground. This is an absolutely unique posture among birds. At nearly 6″ in length, the white-breasted nuthatch is the largest of its species. Males have gray backs with black caps, white under parts and a beady black eye on a white face. Females are similar but wear gray not black on their heads. 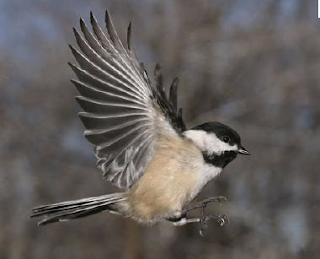 White-breasted’s are thick necked and short tailed with a stocky appearance. White breasted nuthatches calls- uttered frequently in all seasons are nasal and repetitive ank-ank. White-breasted nuthatches prefer deciduous woods, but are also found in large parks and leafy backyards. Here in Northwest Indiana, our coniferous woods, also host the red-breasted nuthatch, which are much smaller in size. 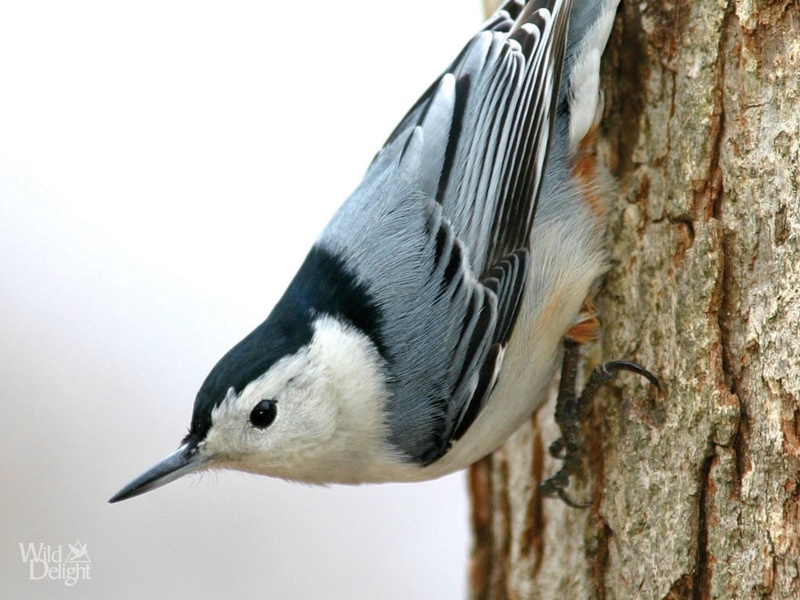 The nuthatch eats both insects and seeds. We see them here at Songbird Prairie daily throughout the year. Insects make up nearly 100% of their diet and seeds are added treats. Autumn’s extra seeds and nuts are sometimes stashed or “hatched away” in tree bark crevices, to be retrieved later. 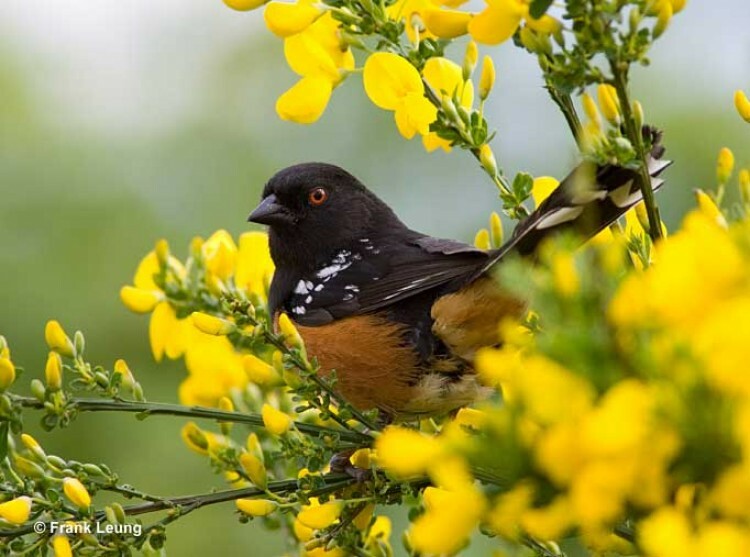 This habit is what has given these birds their name. At Songbird Prairie Inn and Spa they come to the feeders and suet displaying a show for all our guests to see. Nuthatches maintain their pair bond and territory all year long. The nest is placed in a natural cavity, old woodpecker hole, or more rarely a nest box. Built by the female, it is a cup of grassed, bark strips, and twigs and is lined with hair. When the nest is finished, the nuthatches “sweep” the entrance with their bill, rubbing a crushed insect against the wood. The chemicals released may aid in repelling predators. The female incubates a clutch of eight eggs for two weeks. Both parents feed the young for at least two weeks until fledging. In woodlands, listen for the nasal call anytime. Male and female always forage near each other and in winter with other species in a mixed flock. Come anytime of the year to see these characters who will serenade and entertain you. The daffodils are in bloom along with the scilla, crocus, snowdropsand many more bulbs and wildflowers. It’s a sure sign of spring now that the killdeer have returned. They are a large, double-banded plover that screams its name across farm fields and other grass and dirt covered habitats. If you see an orange-tailed, stripe-winged bird calling kill-deee, kill-deee, you can be assured that it’s this plover. Many killdeer were shot during the late 1800’s, along with a wide range of other shorebirds. These species are now protected from harm by federal and state laws. On its white breast, two black bands stand out. Killdeer are wet-sand brown above and clear white below, with white around the front of the face and eye. A farmer’s friend, the killdeer spends its foraging time searching for beetles, grasshoppers, caterpillars and other insects. Crayfish centipedes, spiders and other invertebrates are also eaten as well as some seeds. There will be more on the killdeer, since they are so interesting Efrain and Barbara Rivera, your hosts at Songbird Prairie, want to keep you informed of the beauty of nature here at the Prairie in Valparaiso, Indiana. We have blogged this near the Dunes National Lakeshore. Come and leave your footprints in the sand. Unlike most other plovers, killdeer often forage or nest far from water. You may find them at ball fields, airport runways, pastures, farm fields as well as on mudflats. They are found through North America, but northern birds head south for the winter. 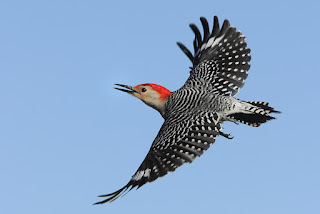 During the summer, you will find them at the Dunes National Lakeshore and Songbird Prairie, our Valparaiso Inn and Spa near Valparaiso University. A simple scrape in the dirt or gravel will do for a killdeer pair, although they sometimes add embellishments, such as a lining of pebbles, grass or other small materials. Females lay three to five blotched eggs, which both parents incubate for just less than a month. Nesting in exposed habitats, killdeer rely on camouflage and deception to keep their eggs and chicks safe. If an intruder approaches the nest, an adult killdeer may feign injury, dragging a wing as if it is broken and exposing it’s bright tail; then lure the person or predator away from the nest. Adults watch over their hatchlings, little puffballs that can run and find food by themselves shortly after hatching. They fly before they reach 1 month. Come to Songbird Prairie B&B for a Chicago romantic getaway, just 45 minutes away. Hear the cry of the Killdeer, come away for that Romantic Getaway. Near Chicago, Songbird Prairie is located in Valparaiso, Indiana and is the destination spa in the Great Lakes Region of the Midwest. Songbird Prairie offers a menu of massages, reflexology, botanical body treatments and facials to enhance your health and wellness. With a combined 75 years of experience, our therapists will leave you in a state of complete relaxation. Songbird Prairie’s variety of services offers customized treatments designed to manage stress levels by balancing your nervous system. Songbird Prairie is both private and has serene surroundings located on six acres of woodlands and prairie. Songbird Spa therapists use the finest quality products, which are botanically based, gentle products proven to provide the ultimate sensual experience. Using essential oils and aromas, we customize spa services adding to your physiological and psychological wellness. Songbird Spa services will lead you to a blissful state of mind. Our customized massages begin with an aroma sensory journey and include, but are not limited to Swedish, Lomi-lomi, Deep Tissue, Reflexology and Mom2B Massage. Our treatments will relieve tension and stress throughout the body and promote emotional calm, removing toxins from the body, improving sleep and elevating your immune system. Thoroughly trained professionals will consult with each guest to match their health and energy goals with the most beneficial treatment.